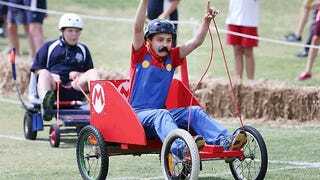 For his school's annual billy cart derby, 12 year-old Australian William Wong did the awesome thing and dressed as Mario, even building his cart to be a replica, of sorts, of the plumber's more recent vehicles in the Mario Kart series. What's more, via The Australian, he won the race! But then he started celebrating. And lost control of the cart. So badly that he flipped the thing, breaking his collarbone in the progress. But it's OK. William had a laugh that he'd "celebrated too early", and was even back at school later that day.